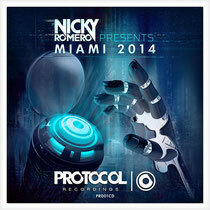 Protocol Recordings boss, Nicky Romero, presents ‘Miami 2014’, a compilation profiling the current sound of the Dutch DJ/producer. Coming to Beatport on Monday 10 March and iTunes on Monday 17 March, the compilation features many tracks including exclusives from artists such as Amersy, Chris Kaeser and John Christian. The compilation also offers forthcoming Protocol releases from Bobby Rock, Sultan + Ned Shepard, Vicetone, Martin Volt & Quentin State and Blasterjaxx, among others. Current Protocol releases from Stadiumx & Taylr Renee, Skidka & Hard Rock Sofa, and Nicky Romero himself round out the package. With the sold-out Miami Reboot party on the horizon and this compilation due out next week, March is looking like a pretty big month for Nicky and Protocol. Get a taste of the compilation below.